Leticia Ribeiro, black belt under Royler Gracie and a driving force behind the Gracie Humaita Female Team, is one of the latest elite BJJ practitioners to release an instructional iPhone App. Leticia, a highly decorated competitor and major proponent of women in BJJ, has also released the Atama Leticia Ribeiro Limited Edition gi and runs regular seminars for women, especially around the USA, such as those organised by Fenom Kimonos. 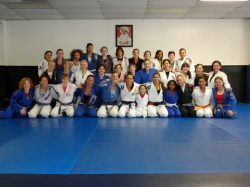 So, I was delighted when the Gracie Humaita Female Team offered me a download to check out the app and share my views. Leticia’s app focuses on the X-guard and includes 13 instructional videos which examine the X-guard in a variety of contexts, including entering the X-guard from a selection of positions to sweeps and range of submissions. The App offers a great guide to options around the X-guard and the instruction from Leticia and her assistant, world champion Bia Mesquita, is clear and detailed oriented, with the technique shown from a variety of angles and at different speeds. While, personally, I had been exposed to the X-guard some years ago, it is only within the last few months that I have started developing this area of my game, so, for me, the App is timely and useful. I have ‘test driven’ the App in a few ways: training with a fellow BJJer; passive watching while commuting; and training with an untrained partner. In all cases, the App was useful and fun. Firstly, worked through three of the drills with a fellow female BJJer and seasoned blue belt. We had no trouble seeing what was being demonstrated and reproducing the drills. Of course, there is no one there to refine the details that you may be missing, but if used in conjunction with regular training with an experienced coach, it seems to have a lot of merit. Secondly, watched the videos while commuting; I take public transport to get to my academy, and going through the drills during my journey was an interesting way to pass the journey and got my mind on BJJ on the way to class. Finally, worked through a couple of the drills with my partner, who does not train. He found it easy to follow Bia’s lead and take the role of uke even though some of the material is quite advanced. I thought that this might be one of the big benefits of the App; imagine roping in your boyfriend, girlfriend, sister, brother, husband, wife, roommate/flatmate or whoever is handy to help you work your drills. As you’ve got a video to guide you both, it is a little more understandable and engaging for the untrained person, and, who knows, they could get the bug and become a more regular training partner! The App is very easy to use and meets its objective to provide a good look at the X-guard. The production values of the videos are high and the instruction is clear, not to mention watching the smoothness of Leticia’s transitions is quite inspiring. If the X-guard is an area that you are very interested in developing, this can be a useful tool to use with your friends and training partners and, personally, I am finding it to have practical benefits for my own drilling. However, the App is pretty dear (£5.99), which seems somewhat steep; while the videos are good quality the App itself has little functionality – it plays videos and includes a bio page and a link to Leticia’s website but it isn’t an interactive experience with the pricey development time associated with that. Similarly, to me, the readability of the navigation and bio pages is somewhat hampered by the use of a background image, grid and multiple colours and behind the text. Nevertheless, my overall opinion of the App is a positive one and I would recommend it to others who are investing in their X-guard game. Thanks to Penny Thomas and the Gracie Humaita Female Team for inviting me to review the App. Photos from Leticia Ribeiro on Facebook.